« Steve “Zetro” Souza is Back! 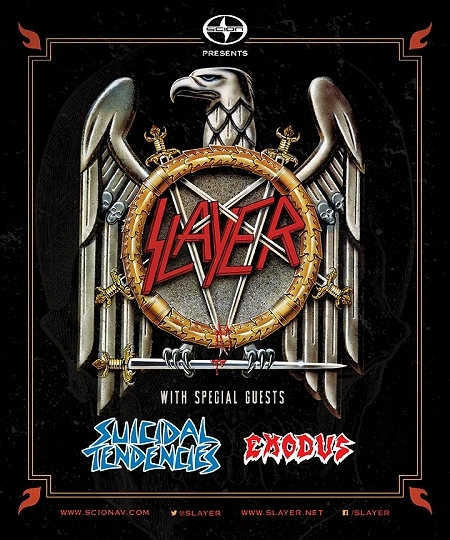 LOS ANGELES, CA – Monday, June 23, 2014 — When Slayer, Suicidal Tendencies and Exodus played a handful of dates together this past May, every date was sold out and fans experienced a night of some of the best metal on the planet. With reviews like “the best show in years that I’ve been blessed to witness,” “a metalhead’s dream come true,” and “…an onslaught of heart-pounding tunes during an evening full of awesome head banging action,” how could this trinity of thrash legends not join up again for a full-on road trip? So, with Scion proudly presenting, Slayer – Kerry King/guitars, Tom Araya/bass, drummer Paul Bostaph and guitarist Gary Holt who continues to fill in for fallen Slayer guitarist Jeff Hanneman – and special guests Suicidal Tendencies and Exodus, will hit the road this fall, kicking off November 12 in Oakland, CA, playing through to December. 5 in Detroit, MI. The confirmed itinerary is below. Slayer fan club members are invited to take advantage of a ticket pre-sale that will begin this Wednesday, June 25 at 10AM (local time) and ends on Thursday, June 26 at 5:00PM (local time). Fan club members will receive an email with instructions for ticket purchasing. Tickets go on sale to the public this Friday, June 27 at 10:00AM (local time) – log onto www.slayer.net for all ticket purchasing details.